McGUIRE, BARRY RIP, Passed away 11th April 2019, peacefully at hospital. Late of Bangor and Whitehead. Beloved husband of Sharon, Loving father of Mark, Katrina, Caroline, Louise and Jennifer. Much loved grandfather of Ellie and Ben, Brother of Desmond and Kieron. Requiem Mass will be held on Monday 15th April 2019 at 10:00am in St Comgalls Catholic Church, Brunswick Road, Bangor, followed by interment to Clandeboye Cemetery. 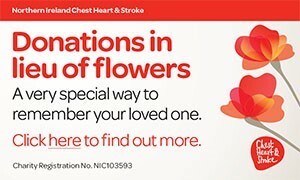 Family flowers only please, donations in lieu, if desired payable direct to Northern Ireland Hospice, Horizon House, O’Neill Road, Belfast BT36 6WB. Will be very sadly missed by his wider family circle. I am sorry to tell you that Barry McGUIRE has passed away.